3.3. /dev/kidekin_trng typical performances: about 40 seconds to generate 10 mega bytes. 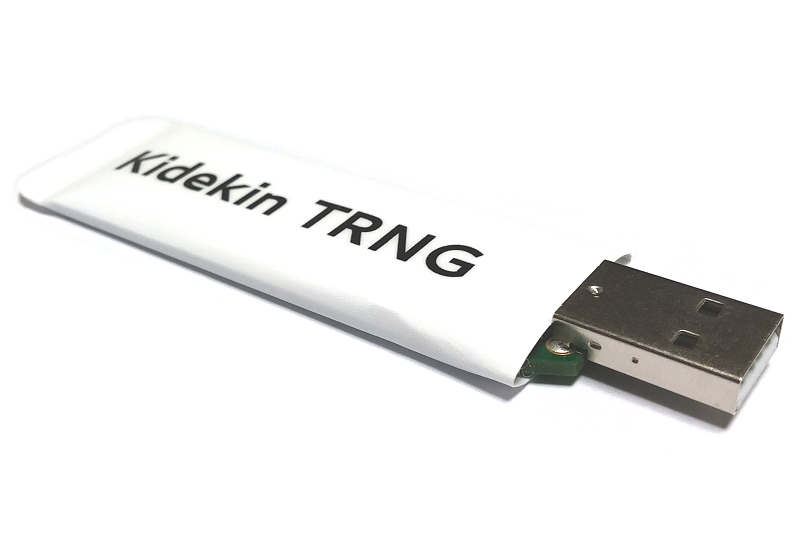 Kidekin TRNG is a true random number generator in the popular "USB key" form factor which can be used in multiple ways on various platforms. The documentation is therefore broken down in several documents, each focusing on a particular task or use case. This document describe the hardware and present the content of the software package. Kidekin TRNG contains a purely digital entropy source rather than analogue one. It delivers full entropy bits at a rate higher than 2Mbits/s (275Kbytes/s). As the entropy source is purely digital, it is much more stable than analogue sources with respect to operating conditions as well as process variations. The randomness comes from an array of small free running oscillators, like in most papers on the subject. The chaotic behavior of such "LFSRs"
The complex feedback structure also avoid the "self alignment" tendency often found with arrays of ring oscillators. Kidekin TRNG implement 8 such LFSRs running in parallel, output is sampled at 96MHz. 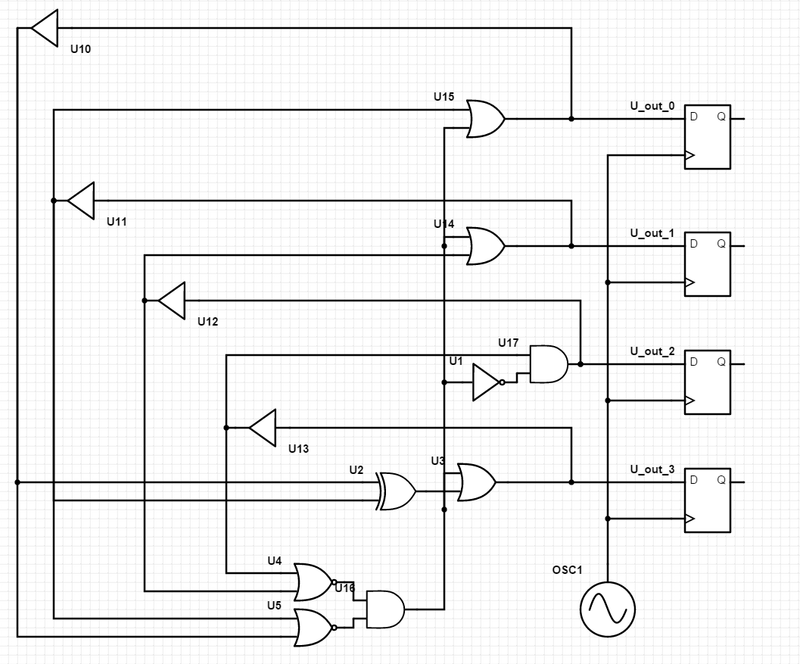 The sampled data is then compressed by a standard CRC-8 circuit to produce output bytes. The raw random bits have a very good entropy out of the box, estimation tools typically report higher than 7.9 bits of entropy per byte. About entropy report by the tool "ent"
ent reports the shannon entropy, and it makes rounding errors on big data files. It reported 8.0 bits/bytes on the same 956MB file. It allows to make the full entropy claim and follows NIST’s SP800-90B recommendations: it is a CBC-MAC using AES-128 encryption. It is done in hardware and cannot be switch off. As a result the device does not have any configuration, making it user friendly and hard to misuse. The access to the raw entropy bits is useful only during the design phase anyway, to know how many blocks the CBC-MAC should process to achieve full entropy. With 7.9 bits of entropy per byte, 3 blocks are enough, actually this would be enough even with 6.7 bits of entropy per byte, so this provides a large safety margin. This is an option because some people may prefer to mix the raw bits with other entropy sources and then perform their favourite cryptographic post processing. The software package contains ready made software to use Kidekin TRNG. The following information can be useful if you whish to build your own software or linux’s udev rules. Kidekin TRNG is based on the USB chip "FT2232C Dual USB-UART/FIFO IC". In this example there is only one such device so we know right away that it is the TRNG. If they are several, the fields inside the device descriptor structure contain unambiguous identifiers. The number idVendor is always equal to 0x0403 and the idProduct always equal to 0x6010 however this is not specific to Kidekin TRNG. The number iSerial (line 17), is unique for each device. It consist of three fields. Daily serial number: an hexadecimal number unique for each device programmed on the same day. The device contains two USB interface, random numbers are available only on the "B" interface. Sending commands or reading the "A" interface can "brick" the device. Sending commands to the "B" interface can also "brick" the device. In summary, only read operation on the "B" interface is supported. The default casing is a white vinyl sticker simply wrapped around the PCB. It protects against light coffee spills only. The optional filling is made in hard epoxy, it is injected within the sticker, protecting the electronics from pretty much anything, including the worse coffee spills :-). If the white cover is peeled-off, it is then tamper-evident, unless one goes through the pain of replicating the filling after damaging it… This option is expensive because it involves a lot of manual work with nasty substances. As both casing are handmade, the dimensions may also vary from one sample to another by few millimeters. The quality of the output has been checked using several tools. For all tests, the data has been gathered using trng_capture.exe. Unless otherwise stated, the tests are run on a file of 954MB (that’s a bit more than 1 billion bits). AIS31: AIS31 reference program from BSI. Test run on 4 MB files. STS: NIST’s STS 2.1.2 (http://csrc.nist.gov/groups/ST/toolkit/rng/documentation_software.html). Data is processed as 1000 streams of 1 million bits. Dieharder: Robert G. Brown’s dieharder, version 3.31.1 (http://www.phy.duke.edu/~rgb/General/dieharder.php). Test run on 4095MB files, command "dieharder -a -g 201 -f file_name". The folder "doc/rpt" of the software package contain those reports and additional ones like cold temperature, hot temperature. of this 1000341504 byte file by 0 percent. would exceed this value 41.49 percent of the times. Arithmetic mean value of data bytes is 127.4978 (127.5 = random). Monte Carlo value for Pi is 3.141736948 (error 0.00 percent). Serial correlation coefficient is -0.000005 (totally uncorrelated = 0.0). sample size = 1000 binary sequences. is approximately = 605 for a sample size = 619 binary sequences. provided in the addendum section of the documentation. of this 1002438656 byte file by 0 percent. would exceed this value 30.61 percent of the times. Arithmetic mean value of data bytes is 127.5056 (127.5 = random). Monte Carlo value for Pi is 3.141427002 (error 0.01 percent). Serial correlation coefficient is -0.000003 (totally uncorrelated = 0.0). is approximately = 610 for a sample size = 624 binary sequences. The TRNG has no control commands, so it just output random numbers as long as the host ask for it. The USB communication is done via an FTDI chip, so your favorite OS is supported as long as an FTDI driver exist for it. FTDI D2XX driver download page: [http://www.ftdichip.com/Drivers/D2XX.htm](http://www.ftdichip.com/Drivers/D2XX.htm) (Note: the VCP driver is not needed). This is a zip file bundling all documentation and software examples for Kidekin TRNG. The latest version and previous ones are available on kidekin’s website. Click this link for direct download of latest version. Most of the time Kidekin TRNG is recognized correctly by Windows which automatically download the right driver. The document trng_tips_windows present some tips if the automatic detection fails or you simply want to do the installation off-line. The software presented in this section have been tested on Windows and Linux and should be able to run on any supported OS with minimal porting effort. They are located in the directory "application_notes_software\ftdi_d2xx". Each application note has a dedicated directory containing build script for windows (build.bat) and linux (build.sh). Those script creates a sub-directory to store intermediate object files and the executables, they therefore need write permission. The directory "common" contain things which are needed in several application notes. generic: this directory contain the C++ code of a thin wrapper around FTDI’s FTD2XX driver. It provides a straight forward interface to access Kidekin TRNG. linux: linux port of FTDI’s FTD2XX driver. windows: windows port of FTDI’s FTD2XX driver, including executable installer. The program trng_capture allows to write random data to a file or the standard output. The standard output is a convenient way to directly feed random numbers to another software. That makes Kidekin TRNG accessible to virtually any programming language without resorting to write dedicated code in the target language. Binaries for windows and linux are provided as well as the C++ sources and simple build batch files and documentation (trng_capture.pdf). trng_capture allows to choose between binary or text output mode, in text mode the output is the conversion of random numbers to hexadecimal, so it looks like "A3BCFD67…" without any white space character. This application note consist of two programs. The program trng_server allows to send random data to another program running on another computer (or the same one). The program trng_client demonstrate how to connect to trng_server and writes random data to a file. The client-server architecture is a way to easily access the TRNG with any programming language, all you need is to connect to a socket and request data. This is demonstrated with a java implementation of trng_client. Like in the capture application note, sources (C++ and java), binaries and documentation are provided (trng_server.pdf, trng_client.pdf). In addition, a step by step guide is provided to get both programs working together. Linux provides convenient mechanisms to integrate hardware random generators, the application notes in this section show how to use them with Kidekin TRNG. This application note show how to mound the TRNG as a Linux special device similar to /dev/random. After running an instal script, each time the TRNG is plugged-in, the device /dev/kidekin_trng will be mounted and ready for read operation in user mode. This is the most natural way to use the TRNG on linux: just read from the device as you would from /dev/random. Since the device has a specific name, it does not interfere with existing applications and your application can have exclusive use of it. The install script just copy a file containing udev rules, this works out of the box without installing any other software or packages. Figure 3.3. /dev/kidekin_trng typical performances: about 40 seconds to generate 10 mega bytes. This application note show how to feed Linux’s /dev/random with the TRNG. This way any program using /dev/random is seamlessly accelerated. This is especially useful on gaming servers or web servers which need to generate cryptographic keys. This is just some udev rules however it does require an additional package (rng-tools). An installer shell script is provided to copy the right files at the right places with minimal user effort. First call to /dev/random is very fast because it just read buffered data, second call is way slower as the system is waiting to gather enough fresh entropy. With Kidekin TRNG, first and subsequent calls to /dev/random are beyond 2MBits/s. In that experiment the last call read 10 mega bytes to minimize the effect of buffering on the performance measurement. Such request is possible only with Kidekin TRNG, without it /dev/random would take an unreasonable time. The performance achieved with /dev/random is slightly lower than reading directly /dev/kidekin_trng or using dedicated software however it allows to use standard software. The definitions given here focus on the context of Kidekin TRNG, please refer to other sources to get an encyclopaedic definition. Cipher Block Chaining Message Authentication Code. An algorithm originaly designed to authenticate data. In the context of Kidekin TRNG, it is used as post processing algorithm, as recommended in NIST’s SP800-90B. True Random Number Generator, as opposed to Pseudo Random Number Generator (PRNG). A TRNG is a device whose output is unpredictable no matter how long one observe it. It is often desired that the output is also uniformly distributed, this is the case for Kidekin TRNG, with or without post processor.